The protein curve, calibration curve, and initial lymphocyte concentration results from last week came back and were excellent, or “acceptable” in research terms. A little more explanation (sans math, I won’t bore you): The protein curve is a plot that measures the concentration of protein loaded into a well of the plate vs. the optical density associated with it. 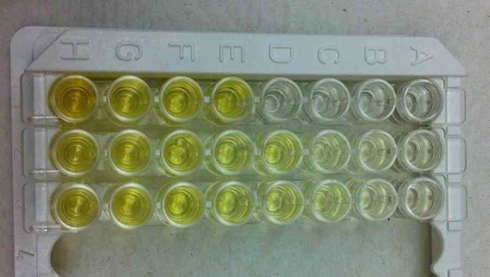 This is determined by incubating the loaded well plates using a dye reagent, which will produce a distinct pigmentation for each protein concentration in the individual wells. Using colorimetry, protein concentration can be quantified by detecting differences in tint and give results based on a specific wavelength. The same goes for the calibration curve, however the purpose for this is to make sure the ELISA Assay kit works, and to make sure the person operating it knows how to properly use it. The initial lymphocyte concentration results are done to get an estimate of the typical concentration of lymphocytes in the blood samples, this is run in tandem – so to say – with the protein curve. This determines the lymphocyte concentrations relative to the known quantities, and depending on the dilution factors (10x and 100x in this case), also gives suggestions about whether or not to dilute samples. That was quite filling; I hope you’re still a little peckish after all that. Warm blood is less pungent smelling than thawed urine, but a tad more dangerous and unforgiving when it comes to your clothes and lab coat. The blood samples are transferred to Vacutainer CPT’s (with Sodium Heparin), photographed below. Figure 1. 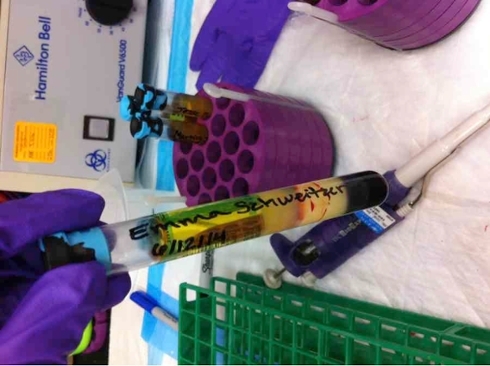 Vacutainer Cell Preparation Tube containing Emma Schweitzer’s blood sample. If you ask me, this is the best picture taken of me so far this summer 2014. If it’s not already hot enough where you are, try drawing you own blood… now feel its warmth. Do you feel vulnerable? I sure do. The gel and density gradient separate the blood into three parts: red bloods cells, lymphocytes, and plasma in that order from top to bottom. After aspirating the plasma, the remaining lymphocyte and density gradient fluid is removed and washed in a separate tube with phosphate buffer, centrifuged, decanted, and the pellet resuspended in phosphate buffer for a second wash. This leaves us with purified lymphocyte samples, and refined blood cells. Imbibe. 1. Don’t forget to bring the book you’re reading if you have to centrifuge anything. 3. How to make a great weigh boat (See Appendix A). A Guide to Making a Suitable Weigh Boat.